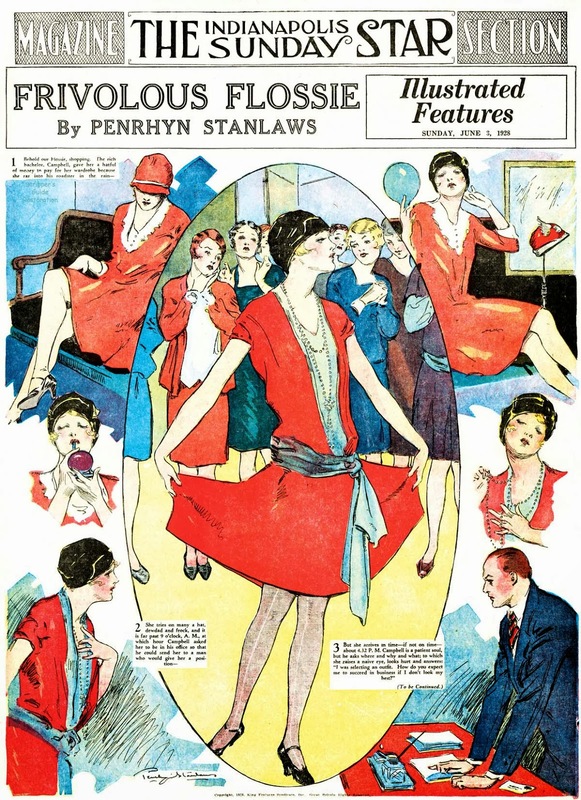 Frivolous Flossie is one of the few Sunday magazine cover series penned by the master illustrator Penrhyn Stanlaws. At least of the type that we cover here on Stripper's Guide. If we are prepared to settle for just any ol' drawings and paintings of pretty gals, Mr. Stanlaws' work graced more magazine covers than you can shake a stick at, though I'm not sure how many that would be. But trust me, it's a lot. The illustrator's brilliantly mysterious and evocative name is, I'm sorry to say, a mere nom de plume. Stanlaws' real name was Stan Adamson. I'll bet it would have taken him longer to become a celebrated illustrator with that moniker. As famous as Stanlaws was in his day, I was surprised to find very little coverage of him online. Here is a page focusing on his Saturday Evening Post covers, and here's one with a selection of art. Oddly, he only seems to have Wiki entries in other languages -- the Italian one includes a particularly lovely piece of his art. Frivolous Flossie was in the King Features-distributed magazine package in 1928. It started on June 3 or earlier, and ended on September 23.